Hi there, first time posting and looking for some advice from the Orange community! 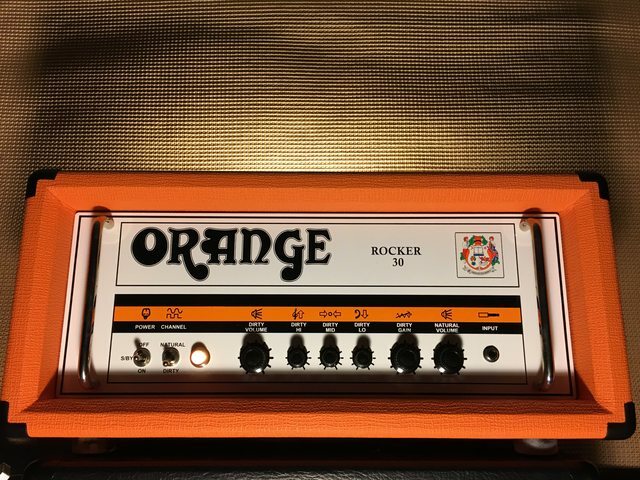 I've recently purchased a Rockerverb 50 mkii head second hand. I was trying out a range of settings/tones/volumes and I noticed a very pronounced whistling/squealing sound (like a teakettle) when the gain is set at around 3 o'clock or higher (if I back the gain off to 2 o'clock it disappears). This only happens on the dirty channel. The sounds seems to disappear when the volume is all the way down, but increases in volume with the volume control. It seems to fade or disappear when I'm playing, but returns with a vengeance when I turn the volume off on my guitar. I disconnected the guitar and the whistling is still present. The background hiss on the high gain setting also seems a bit loud (also increasing in loudness when the volume it turned up, again just on the high gain setting). I haven't got any spare tubes, but will look to pick some up to troubleshoot, but I'm worried it could be something more serious or costly to fix. I would love to hear from anyone who may have experienced this or has any advice about what this might be and how to remedy it. Any help is much appreciated. Sounds likd a microphonic tube. You can try swapping some of the tubes from the clean channel to see if it goes away on the dirty, however they could be microphonic as well. Thanks so much for your reply. I thought the same--a microphonic tube, so I set about some troubleshooting last night. I started by doing the pencil tap test on all the tubes (preamp and power). Most seemed ok, a very faint sound through the speakers from one of the power tubes, but barely audible. One of the preamp tubes had a very audible 'thump' coming through the speaker, so I thought that was the one. I swapped nearly all the tubes with one another, one at a time, but was still getting the squeal. Did the pencil tap again and lo and behold, it was the same socket (but different tubes) making the noise (dirty channel, stage 1 and 2---second tube from the right front when facing the front of the amp). Seems like this is the likely culprit, but I'd appreciate some advice about what it might be (loose/faulty tube socket? A different electronics issue?). I should note that when the tubes were in other sockets (aside from the dirty stage 1 and 2 socket) there didn't seem to be any noise from the pencil tap, so they seem ok (at least from that perspective). If it's a socket or other issue, what kind of cost range would I be looking at for a repair, roughly? Should I contact the seller and try to return the amp rather than put up with this fuss? It's really frustrating as I love this amp, but I don't want to fork over hundreds of dollars on a repair I didn't bargain on. It's really difficult to estimate any possible repair costs, as we can't determine if your amp is faulty and what causes the fault if there's one. My guess still is microphonic preamp valve. With 4 gain stages, the dirty channel will amplify microphony a lot more than the clean channel. Until you have fitted some good (known not to be microphonic) preamp valves in V2 and V3, you can't be sure that the fault is with the amp. So, finally received the pair of 12AX7's (JJs) I ordered, which I swapped into the V2 and V3 sockets. Problem solved! No more whistling or windy hissing, and an absolutely ferocious amount of dirt. This thing is a beast (when you need it to be)! Will probably do a full valve swap and biasing at some stage, since I believe all the current ones (with the exception of the ones I replaced) are stock, but for now I'm happy--this amp sounds phenomenal. I'm glad that's what it was!!! In terms of valve swapping, i would do the EL34 1st if you can. Preamp valves usually last pretty much forever (unless they go microphonic.....), and the likelihood is that the other preamp valves are still good. Enjoy making some noise now!!! !